courtesy of monkeytreecreations in honor of the March participants of TheSpottedBox! Thanks for including my Erlenmeyer Terrarium kit! 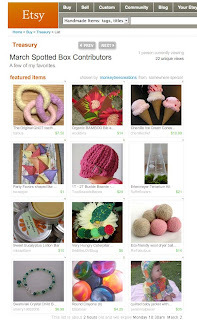 I just stumbled upon your blog, and I love your Etsy shop!! Will be buying some goodies from you this Spring ~~ maybe if they grow, I'll be able to paint them! !